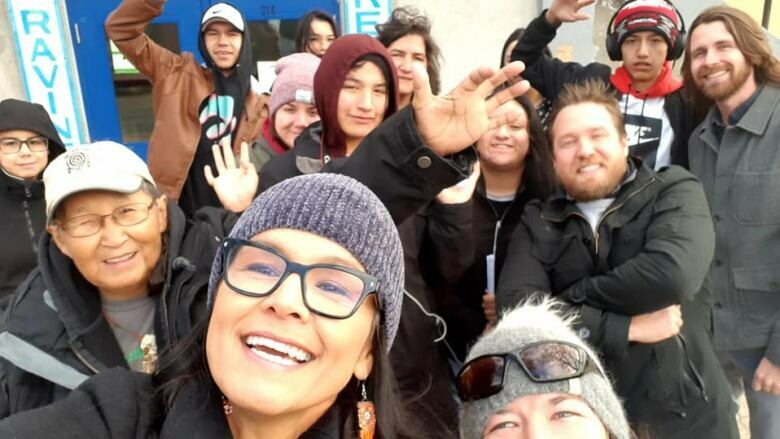 Local residents Sue Hamel and Michelle Derosier brought students from Dennis Franklin Cromarty High School and the Matawa Learning Centre on walking tours of Thunder Bay, stopping in at different restaurants and cafes along the way. Two Thunder Bay, Ont., residents, armed with a grant from the PARO Centre for Women's Enterprise, launched an initiative this week to help Indigenous students from northern First Nations feel more welcome in the city — by introducing them to the city's food culture. Sue Hamel and Michelle Derosier brought students from Dennis Franklin Cromarty High School and the Matawa Learning Centre on walking tours of the city, stopping in at different restaurants and cafes along the way. Students sampled baked goods at Bay Village Coffee, pancakes at the Hoito, salt fish at the Scandinavian Home Society, meats and cheeses at Maltese Grocery, pizza at Donato's and various offerings at Sweet North Bakery. They also visited the Ahnisnabae Art Gallery. Derosier told CBC News she had been thinking of doing something for a while to try and address the city's challenges with race relations, and the walking tours seemed like a "really beautiful, simple thing to do." "I know that this community has so many amazing, beautiful people in it that are non-Indigenous and that really really have been trying to figure out ways or really welcome ... doing things that can create a safer more welcoming environment for students, visiting Indigenous people, young families that are moving here and new to Thunder Bay," Derosier said. Bay Village Coffee owner Gary Mack welcomed the students to the cafe and handed out gift cards to encourage them to come back. "We want to say that, there's a lot of negativity in Thunder Bay, and they're well aware of that," he said. "But there's also a lot of really positive things about Thunder Bay, and there's a lot of great people here. And we're just wanting to let them know that this is a place that's safe, and they're welcome here any time." "We'd love for them to come back." The organizers said they hope to schedule another round of walking tours before Christmas, Derosier said.